Ends of various shapes: blunt, round, in forked shape. Many parenchyma cells of various shapes, colored in blue forms. Contain a mucilage. 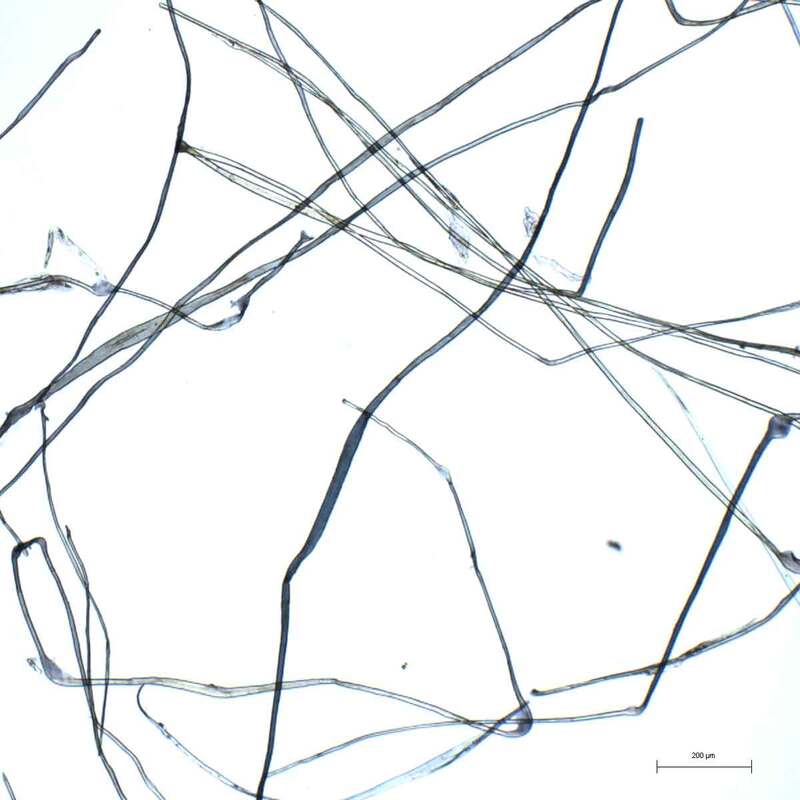 Rather short Fibers blades with pale marks on the surface with large central areas. Crystals in the parenchyma that does not exist in the gampi. China (Wild or cultivated. Fujian, Guangdong, Guangxi, Guizhou, Henan, Hunan, Jiangxi, Yunnan, Zhejiang), Korea (Wild or cultivated), Japan (Cultivated and naturalized), Georgia. Wild in forests, shrubby slopes but also cultivated. Chubu (Fukui, Gifu, Ishikawa, Shizuoka, Yamanashi Prefectures), Chugoku (Okayama,Shimane,Tottori Prefectures), Kanto (Saitama), Shikoku (Ehime, Kochi, Tokushima Prefectures), Kyushu (Miyazaki, Saga Prefectures), Okinawa. The Edgeworthia’s are shrubs of the Thymelaeaceae family, which includes nearly 500 species distributed in 44 genera. The Thymelaeaceae are base plants for paper making at the foot of the Himalayas. 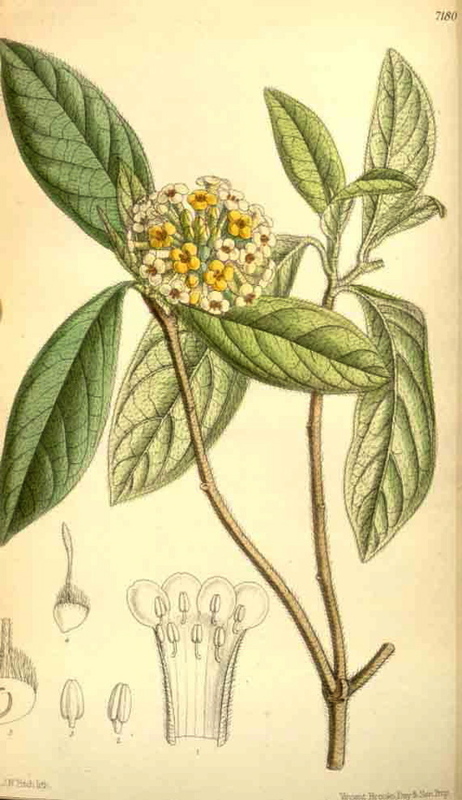 The plants are valued for the large amount of hemicelluloses contained in the bark. They are also much used in Chinese medicine. 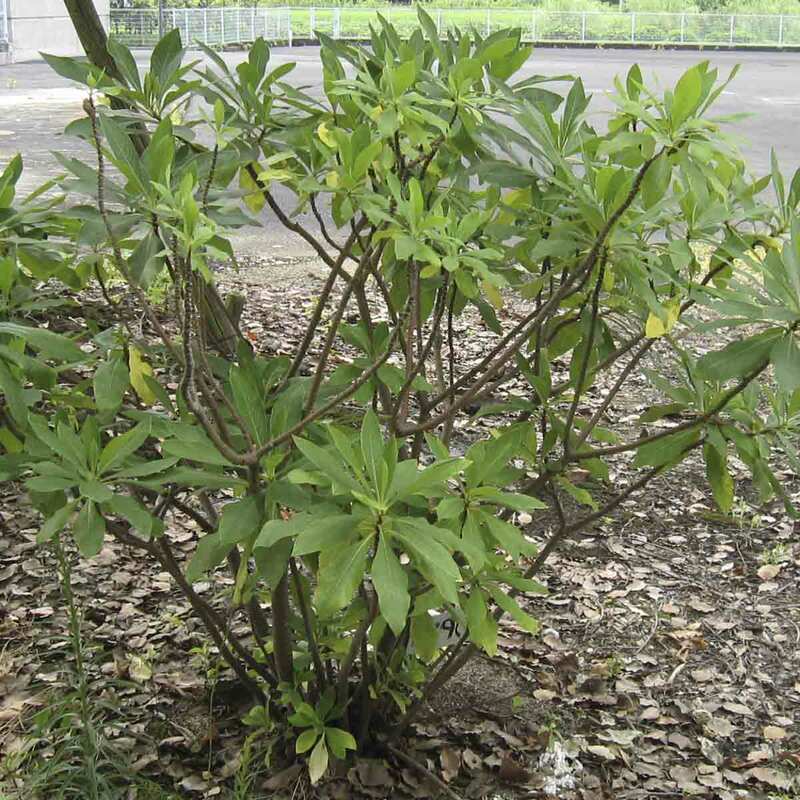 There is a great confusion between different Daphnes and Edgeworthias; shrubs are very similar morphologically and names are assigned interchangeably. However the bark of the Edgeworthia is whiter and softer than that of Daphne. Edgeworthia chrysantha is a deciduous shrub, growing slowly up to a height of 1,5m. Flowers are yellow or red and flowering occurs in March to April. It grows wild in forests on the shrubby slopes but it can also be cultivated on the hillsides interspersed with cedars and cypresses. Its growth is faster in warmer and humid climates. It blooms from February to April. After 8 to 12 years, shrubs are no longer able to provide enough good quality bark for paper. Its fruits are not edible. Its roots are used medicinally to treat eye diseases. The bark contains an insect repellent. The stems which are very flexible can be tied or used as strings. The term mitsumata means triple (mitsu) branch (mata) and refers to the shape of the shrub. Mitsumata fiber papers are much more expensive than kozo (cf. this term) papers because cultivation of the shrubs is more difficult. However, it is easier than the cultivation of gampi (cf. this term). Generally, growing, harvesting and preparation of bark are carried out by farmers who supply raw bark, ready for cooking, to papermakers. Mitsumata papers have different uses but they are especially popular for calligraphy and printing as they allow fine strokes. The mitsumata fibers replace those of hemp during the Edo period (1603-1867), but their use had started from the Momoyama period (1573-1615). Cultivation of mitsumata, as well as kozo, is encouraged at the beginning of the Edo period in the prefecture of Fukui. The production of paper with mitsumata fibers begin with the papers called shuzenjigami after the name of the locality or Suruga hanshi after the name of the former province, in the prefectures of Shizuoka and Yamanashi. These papers are a mixture of gampi and mitsumata fibers but these terms also refer to paper made with gampi or kozo. From the Meiji period (1868-1912), Shizuoka is also a production center of mitsumata paper for the manufacture of banknotes. The valley of the Saji (Tottori prefecture) has become a major producing region of mitsumata and mitsumata papers during the Meiji period. Currently, annual production is about 360 tons. The main producing prefectures of bark are those of Ehime, Kochi, Tokushima in Shikoku region, Okayama, Shimane in the Chugoku region. One hundred kilograms of harvested mitsumata gives three to five kilos of paper. The term Samji daknamu, means three branches and refers to the shape of the shrub. There are no specific reference to the beginning of its use as paper fibers or its cultuvation. It grows wild on the southern coasts of Korea. Samjidak papers were mainly used for printing books and sutras. Harvesting takes place every three years in early winter when the leaves have fallen. The branches are steamed for easy peeling. They are then dried before being stored. At this stage the bark is called "black bark" or "kurokawa". The barks are soaked and then scraped with a knife; at this point the bark is called "bark unbleached" or "jikegawa". It is left to soak in water for several days to bleach. Bleaching is done in the sun but recently chlorine is used. The bark is called "white bark" or "Shirokawa". Cooking is done at the jikegawa stage. It lasts around 2-3 hours. The alkaline solution is an ashes lye or lime or caustic soda. After cooking the barks are placed in running water for several days to remove residues of cooking. It also helps to complete the bleaching. Beating is performed by hands or in a small size Japanese hollander called naginata. Specks removal is done by hand. Sheet forming is done by nagashizuki method: in the nagashizuki method the sheet is made by superimposing layers of fibers successively until the desired thickness.